Goodness! This weather has been driving us up the wall. 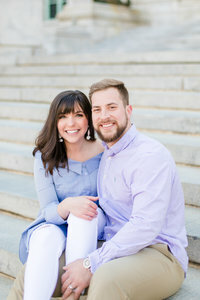 We have had to reschedule all of our portrait session EXCEPT this amazing Southern Maryland maternity session you are about to see with Michael and Amanda, and we have an engagement session tonight in Old Town that we will actually get to do! We had texted Amanda and asked if she would want to reschedule to the following week but she said that she wanted to do it and get it done so she could finally enjoy a cookie! Haha!! We feel you, Amanda, the sweet tooth is real. And we’re sure your little girl is making yours even sweeter! We actually got to photograph Amanda and Mike’s destination wedding in Jamaica so it was SUPER special for us when they asked us to photograph this special season in their lives as well! Amanda is the most beautiful momma I have ever seen! This little baby girl is going to be one well-loved child when she comes into the world because she’s already spoiled and she’s not even here yet! A few weeks ago, we were at Amanda’s baby shower and this little girl will have no shortage of love coming her way. Amanda and Mike, we can’t wait to meet your little sunshine and have the honor to watch you two grow as parents. This is so exciting! !